I've been suffering from eczema since I was a child so my skin is very sensitive. As I got older I didn't want to use so much steroid creams and moisturisers from the doctors so I tried to find a more natural alternative that works well for me. 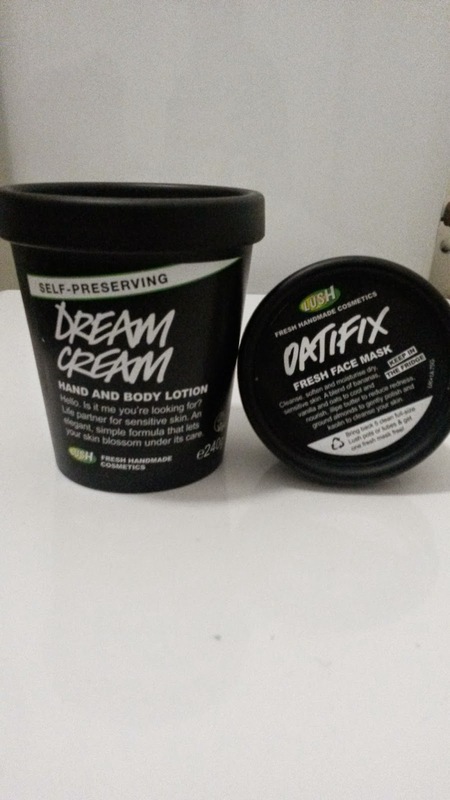 I found two products from Lush which isn't super expensive and so far they have worked well without giving my skin any flare ups or irritation. This is a nice nourishing face mask made from bananas, oatmeal, illipe butter, vanilla, ground almonds and other natural ingredients. I first put a nice generous layer of the mask on for about 5-10 mins then wash it off with warm water. I would rate this product a 9/10 it makes my face feel so soft and supple. Oh and by the way this lovely mask needs to be kept in the fridge. After the mask I pat dry my face with a towel then use. This cream is a nice all rounder cream which doesn't irritate my skin like other scented creams. Dream cream has many brilliant ingredients such as oats, rose water, chamomile blue oil and organic extra virgin olive oil. It does me justice during the cold winter weather here in London and it doesn't dry out my skin. It doesn't smell bad either. I would rate this product a 8/10.